having the same ingredients going from top to bottom as it has going from bottom to top. At first I thought it was surface tension that separated the layers of a built cocktail. However, it seems it is density that determines where a particular component will go. One of the resources on density I found was this spirits density chart. Now, of course: no particular spirit is found twice on that chart! This makes the palindrome cocktail quite a challenge. The Question: Are there any products, tricks or techniques available to separate layers in a built cocktail without relying on density? Separate layers with a sort-off crême-brûlée-style crust. However this will most not seall off completely on the edges, plus I risk setting the spirits on fire. Use some kind of gelatine product? As a side note, even though my question is about a true palindrome drink (with the exact same spirits top-down as bottom-up), if there are no real tricks, I'd also be interested to see some added suggestions on a "fake" palindrome where it's just "looks" like a palindrome (color/transparancy wise). I tried this, but given the above density chart that felt as a hard-enough challenge in itself. I'll update this section as I experiment with provided answers (but the question above won't change, of course). A Cointreau + Baileys + butterscotch liquor. An attempt to make a color-based palindrome (a cheat! ), but the colors are obviously not similar enough. B Dark Rum + Cointreau + Dark Rum. The bottom dark rum was mixed with gome syrup and even more sugar (as much as would dissolve) to make it sink to the bottom. Based on this answer below. Still have to work on color though. J1 Cherry-butterscotch-jello + lemon liquor + cherry-butterscotch-jello. The top jello kind-of sunk inside the middle melon layer. J2 Cherry-butterscotch-jello + lemon liquor + cherry-butterscotch-jello. Same as J1, only more careful sliding the top jello in on the back of a spoon. J3, the proof of concept! Melon-liquor + cherry-butterscotch-jello + lemon liquor. First I put the bottom liquor in the freezer, then the jello on top (wiggle it in place), then more liqour on top, and wait a few minutes for the bottom layer to melt. Although I'd accept any tricks that allow a basic palindrome-cocktail, I'd be extra happy if they allow for palindromes above 3 layers (so 5 layers and up). You could, of course, create gel layers, and the determining factor in stability would be the firmness of those gels. However - and I suppose this is just a hunch - I seriously doubt that a gel firm enough to hold the weight of all the heavier layers above it (and you are asking for at least 3) would really be drinkable, unless you're aiming for the consistency of a "Jello shot". A better idea, in my opinion, would be to simply change the densities of certain layers, and an effective (and tasty) way to do that is with sugar, or more accurately, sugar syrup. There's a type of syrup used in bartending called Gomme Syrup, which is a thick sugar syrup with Gum Arabic added to prevent crystallization (among other things). Sugar, by itself, has very poor solubility in alcohol, but sugar syrups and gomme syrup in particular will have few problems, considering that's already how many mixed drinks are made (like Whiskey Sour). If you're feeling really adventurous, you could also use sugar alcohols such as sorbitol or xylitol, which dissolve readily in ethyl alcohol in solid form. However, these are much more potent (sweetness-wise) than sucrose and some people report gastrointestinal reactions, so use at your own risk. Sugar syrups are very dense, so if you mix them thoroughly with a particular spirit, you'll end up with a heavier (and sweeter) version of that spirit. So to make your palindrome, start with what you'd normally put at the top (say GM for the B52), mix it with syrup (it shouldn't take an excessive amount - maybe 20-30% by volume, but you'll have to experiment), and layer that on the bottom. Then take the next-lightest, mix it with slightly less syrup, and continue. Once you reach what would normally be the densest liquid, layer the drink as normal up to the top with the "pure" spirits. The more layers, the more math you'll have to do, because you'll need to make sure that you add just enough syrup to layer 2 so that it's lighter than layer 1 (bottom) but still heavier than layer 3, and so on. Unless you're prepared to make the drink very sweet, you'll need to be fairly precise in your calculations. Disclaimer: I haven't yet tried this myself, as it's the first I've heard of anyone trying to do this. However, I see no reason why it wouldn't work with proper (careful) layering technique. In fact, I remember doing something very similar all the way back in primary school, called rainbow in a glass. Use different ingredients on the bottom and top. 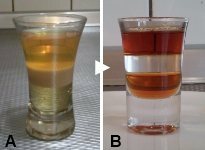 So your cocktail construction is really A-B-C-D-E. B and D should be the same color, but B should of course have a higher density than C, D, or E. Similarly, A and E should also be the same color but different densities. Start the same ingredients for corresponding positions, but alter them to change their densities. So, your A-B-C-B-A cocktail is really A1-B1-C-B2-A2, where A1 and A2 are the same spirit, but you've added a lot of sugar or something like that to the base A. Try using food coloring to make one of the liquors match the color of the other one. For example, rum & vodka, then use a different color in the middle. Though impractical, brine from the ocean sometimes drops to the bottom of the sea floor and refuses to mix with the rest of the ocean. If taste wasn't an issue, you could make one super-saturated with salt so it sinks. Also, vary the temperatures of the same liquor, so the colder batch sinks. If you freeze it to near it's freezing point, perhaps with liquid nitrogen or dry ice, and keep another batch near the boiling point, perhaps in an oven, then they would not mix readily. You'd have to gently spoon it into the glass. A combination of the above will also work. Make some thin gel cups out of sodium alginate. Then serve it with a straw so the straw can pierce through the gel cups and you can get to the layers that you want. I think you can even flavor the gel cups with different flavors if you want to be fancy! Not the answer you're looking for? Browse other questions tagged alcohol molecular-gastronomy cocktails or ask your own question. I have difficulty finding “ANGOSTURA” bitters, is there any substitute?